We know it's not fun having to refill your your saltwater or freshwater sumps or tanks bucket by bucket because of the daily water evaporation! Well we have a solution for you - the new ATO unit by JBJ. So what makes the JBJ ATO a wonderful piece of aquarium equipment? Quite a few things actually. This auto top off unit has some great features. The auto top off unit has 2 float sensors that activate within seconds when your water level drops. This enables filling of your tank in small increments throughout the day to your desired level. No need to worry about your saltwater critters damaging the sensors as each unit has a gaurd on it. This will prevent snails & hermit crabs from attaching to the A.T.O sensors. With its elaborate electronics you now have (2) modes of operation with a total of (3) different set up scenarios. Includes a LED panel + our innovative Audible Signal alerts when in operation mode. Now you are able to turn this function on or off. Your ATO professional kit includes commercial grade "Linkable Brackets" that can easily be adjusted to meet your height requirements, and securely positions your float sensors. Many competing brands use inferior suction cups that are temporary that can lead to disastrous water spillage. The JBJ ATO automatically stops power to your return pump in you reservoir, in the event that your reservoir is low on water. This safety feature prevents pumps from running dry and failing. The JBJ ATO is a high end unit with a not so high price. 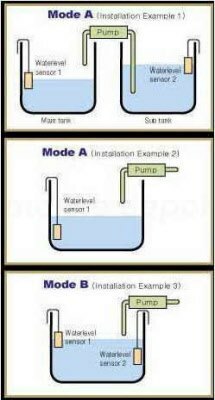 What it accomplishes it the automatic refilling of an aquarium or other body of water. It can be used in freshwater or saltwater tanks. Filling tanks daily from evaporated water is a thing of the past. The All-New JBJ A.T.O. 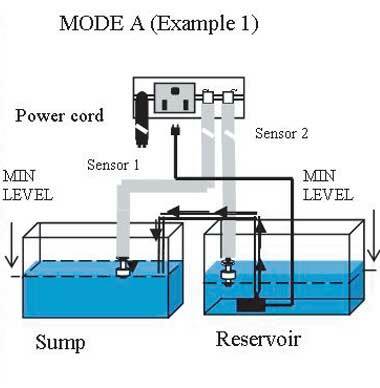 (Automatic Top Off) device is a splendid water level controller system. Maintaining stable salinity and specific gravity are no longer a problem since the A.T.O. will refill as soon as the water level drops. This stable pH and water salinity will lead to less stress for your fish. The JBJ A.T.O. will keep all salt levels at consistent parameters, ensuring an optimal environment for your tank inhabitants. latest version comes with switch to turn on/off audio alert. Works great. Keeps constant water level within 1/8" to 1/4"
Can be used like a dosing pump as well for medicating fish tanks and aquariums or any body of water. JBJ Unibody LED Fixtures Incredibly thin. Incredibly capable... Designed, Tested CNC Manufactured in the USA. Let the surfin' begin with the JBJ Ocean Pulse - DUO Wavemaker (2 pump capacity). This unit will create a living seascape of alternating waves in your aquarium.